Eyeon Fusion’s Merge tool allows for additive and subractive compositing. Additive assumes that images are pre-multiplied. This is the default for most compositing in Fusion. Subtractive assumes that foreground image is NOT pre-multiplied. The Merge Tool will pre-multiply the foreground image by it’s alpha then do an additive merge. Generally images should be pre-mutliplied with black. If I’m working with 3d rendered images this is normally the default. If I’m working with green screen or rotoscoped footage I may need to do some work to remove colour from the edges. The Subtractive Additive slider is a quick and easy way to darken edges of the foreground image. The missing additive blend mode? 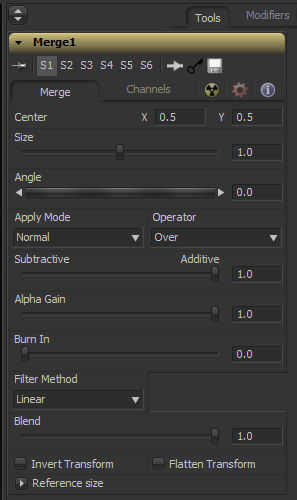 Set ‘Apply Mode’ to ‘Normal’ and ‘Alpha Gain’ to zero for the ADDATIVE BLEND. This mathematically the same as an additive blend. If a Subtractive merge is used the foreground ( A ) is pre-multiplied in the merge operation. The various operator options control where the foreground is merged with the background. The table below shows how the different merge operations determine FA and FB . This table is based on the 1984 SIGGRAPH paper, Compositing Digital Images, Porter and Duff. Normal mode is A over B. Substituting the formula from the table above we get these simple functions for merging one image over another. Alpha Gain and Burn In sliders. Alpha gain and Burn In sliders scale the foreground alpha to create screen like effects. When G = 1 and U = 0 these equations can be simplified to the maths above. It’s worth noting that using Burn In with floating point maths can give alpha values above 1.0. The foreground alpha is essentially doubled where it crosses the background. The Merge tool offers a host of Apply modes many of which emulate photoshop layers. The Subtractive Additive slider is disabled in these modes which makes the maths a bit simpler. Screen Mode is not effected by alpha at all. Otherwise images should be pre-multiplied before using these blend modes. In all these apply modes image alphas are combined using this equation. Gringo’s apply modes comp demonstrates the maths in Fusion using custom tools. I’ve summarised most of the maths in the table below. This is based on Delphi’s photoshop maths. Note: I’ve flipped the notation in my article… A = b, B = a.
I’ve also used some maths shorthand and removed the * sign. So; 2AB = 2*A*B, 2(1-A) = 2*(1-A), etc.